The Schools of the Future initiative started in 2008 and is sponsored by the Hawaii Association of Independent Schools and the Hawaii Community Foundation. This was the first Schools of the Future conference held at the Hilton Hawaiian Village and featured the world-renown speaker Sir Ken Robinson. 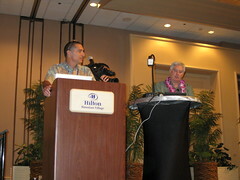 I got a chance to attend a couple of the break out sessions including Mark Hines and Bob McIntosh of Mid-Pacific Institute about Mobile Technologies in the Classroom. They provided a very thought provoking presentation about the near ubiquitous presence of mobile devices and the implications in the classroom. The mobile device is no longer just a phone but a computer and a gateway, able to link us to information, applications and our community. Their presentation emphasized how these devices cannot be ignored or disallowed in the classroom. The inevitability is that the mobile device is a tool and best understood by embracing its use. Their presentation is available on the Future Schools site along with other resources from the community that formed around the Schools of the Future initiative. In the afternoon, I got a chance to a hear Mid Pacific Institute teachers give examples of project-based learning in a presentation called: Embracing Change in the 21st Century, that got implemented in classes ranging from pre-school, elementary, middle to high school. Principal Edna Hussey did a timely job posting her overview of the presentations to the MPI blog. In one class example, Alison Ashford challenged her environmental studies high school students to build a layer in Google Earth showing the trees located around campus. You can try the resulting layer by downloading the .kmz file which automatically launches Google Earth. You can find more info here. I also found it interesting how the organizers, the Hawaii Community Foundation, incorporated graphic recording into the presentations. 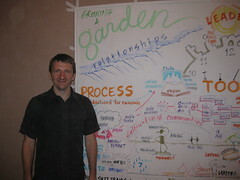 They invited Nick Payne from England to do a graphic recording of each of the presentations in this breakout room. You can view the rendition of Nick’s recordings here. Judging from the interest shown by the educators there was an overwhelming level of support for the visual presentation. It’s a great way to capture the essence of the presentation and offer a means to perpetuate it through the organization. I’ve seen the technique work first hand at the place I work. Ongoing interaction of the Schools of the Future community continues on the Ning site at Future Schools. It is quite encouraging to see such dedicated, passionate teachers committed to education and the innovative process. Judging from the interaction the site, there is a groundswell of activity taking place in the schools. Burt Lum is a Member of the HMSA Center for Innovation in Health Care. His focus is new media, technology and the future of the web. He co-hosts a tech show on Hawaii Public Radio at BytemarksCafe.org. Burt can also be found at Bytemarks.org and on Twitter @Bytemarks.